Pimcore allows you to localize every document. You can find the setting in your document in the tab Properties. There you can choose from language which is configured in the system settings. The selected language is registered as a property on the document, which is inherited to all of its children. If you have selected a language this will be automatically set on your request object ($request->getLocale()) and is therefore automatically used for shared translations, localized object lists and all other localized kind of contents. Once you have defined the language of your documents you can also use the translate helper in your views, as described here. Pimcore uses the standard Symfony translator, so you can even access all the translations provided by your bundles. Every document has one single language/locale assigned. As a consequence of that, Pimcores best practice in terms of building multi-language websites is to build a document subtree per language. The localization tool for Pimcore documents is a comfort tool which supports creation and management of the same document for multiple languages. It can be accessed in the editor button row of every document. Open Translation to quickly navigate to the corresponding document in another language. Content inheritance is a Pimcore feature to save duplicate data maintenance within documents. This feature is quite handy in multi language document structures in order to maintain language independent content only once. For details see Document Inheritance / Content Master Document. Pimcore comes with a translation module for the website which is explained in Shared Translations. This is what needs to be done to use translations in templates and display them accordingly on the website (frontend). E.g. 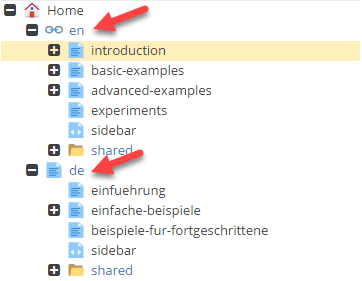 button names, labels - all the stuff that is predefined by the template and not entered by the editor.